Maungdaw, Arakan – An 8-year-old Rohingya was shot by Myanmar’s Border Guard Police in Maungdaw Township of Arakan State. On January 12th at 5 pm Riaz Uddin s/o Noor Amin (28 year old) from Myoma Taung Ward in Maungdaw Township, was chatting along with his friends at a hut by the shore in Maung Ni village. Suddenly, the Border Guard Police arrived and arrested him. While the Border Guard Police (BGP) bring Riaz Uddin to the outpost the boys were playing football at the football field at Myoma Taung Ward. The boys were celebrating and chanting as they kicked goals at each other. The BGP police presumably thought that the children were preparing to attack them. The BGP opened fire without asking anyone. A boy named Noor Huda s/o Kabir (Age 8) was hit by the bullet on the left leg and seriously injured. The BGP police took him to Maungdaw hospital and the boy is at Emergency unit at this moment. 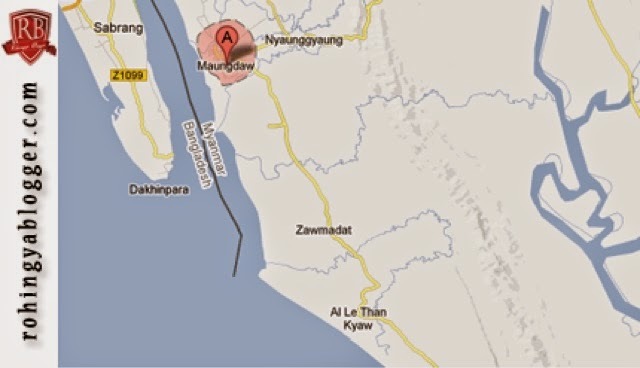 Myoma Taung Ward is located next to Maung Ni village. "All children are under 10-year-old. Even they are chanting against the police. These children can do nothing against the police. There was no reason to shoot innocent children. They found no reason to shoot but shot them in the name of attempt to attack them. The children were just enjoying football and celebrating their goals. The children know about brutality of the authorities here. So they will never attack or they won’t even see the police. These BGP are worse than previous Na-Sa-Ka. The president Thein Sein saying about democracy but our situation here is worse than previous military regime." a local told RB News.